First Words : Thank You Sem. As I am sure that many past and present pupils as well as the parents of the boys would like to have a clear picture of the history of St. Joseph's, we give here an account of the foundation and progress of the school over the years in so far as we can glean it from the annals of the College. St. Joseph's Seminary originally located at Darjeeling and transferred to Naini Tal in 1887 was formally opened in the present site by His Honour the Lieutenant Governor on the 17th June 1889; having been solemnly blessed by His Lordship The Bishop of Allahabad on the 16th June 1889. Until the end of 1887, Darjeeling had been under the jurisdiction of the Vicar Apostolic of Patna who became Bishop of Allahabad on the establishment of the Roman Catholic Hierarchy in India in 1887. In December Darjeeling was handed over to the Bengal Mission of the Jesuits. 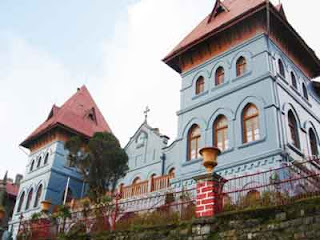 The Capuchin Fathers had a school in Darjeeling known as St. Joseph's Seminary and when they left Darjeeling, the Staff and Students were transferred to Naini Tal and a temporary residence secured for them at Long View (below St. Joseph's). Here the School was carried on until the Seminary was ready in June '89. In 1885, and while Darjeeling was still under his jurisdiction, Dr. Pesci went to Ireland and endeavored to get the Superior General of the Irish Christian Brothers, Very Rev. Br. R.A. Maxwell, to give him some Brothers for his Indian Mission. The Superior General could not spare any Brothers at that time. In 1889 by order of Propaganda, the Irish Christian Brothers took over the Calcutta mission and received into their order a Religious Congregation known as the Calcutta Christian Brothers who had charge of the Catholic Male Orphanage and St. Joseph's School in Bow Bazar Street. The Irish Brothers landed in India in January 1890. In June 1891, Dr Pesci once again renewed his efforts to get the Irish Christian Brothers into his Diocese. He sent one of his Fathers to Calcutta to interview Bro. Fabian Kenneally, the Provincial of the Brothers there. Br. Keimeally forwarded the Bishop's application to Ireland. Some months passed by and in March 1892 Bro. Fabian got four Brothers out from Ireland to take over St. Joseph'~ Seminary at Naini Tal. On the arrival of the Brothers in Calcutta, Bro. Fabian set out for Allahabad to complete negotiations with the Bishop. He visited Naini Tal, arranged everything with the Bishop, and after a few days returned to Calcutta for the Brothers. The Brothers he selected were Bro. Stephen Cuddy, of the Old Calcutta Congregation, whom he appointed Principal, Bro. Baptist Moloney and Bro. Luke Rice. He could spare no more Brothers at the time and as the attendance at the Seminary was then very small, only 43 pupils, these few Brothers with a few secular teachers were sufficient. On the 22nd of April Bro. Fabian and his three companions arrived in Naini Tal and on the 25th took over formal charge of the Seminary. From that date onwards it was under the direct authority of the Christian Brothers. For some weeks before the arrival of the Brothers, efforts had been made by some outside sources to create an ill feeling against the Brothers and hence it is not to be wondered at, that the Brothers found only a small number of boys when they took over. On the 19th of September that year the school was examined by the Government Inspector--Mr. Todd. Among his remarks are "The school has been brought under an entirely new management and instruction. The numbers have fallen off a great deal since I visited the school last year, but I am sure this is only temporary. The school is one of great promise under the careful management of its able and long experienced Principal, Br. Cuddy". During the winter holidays of 1892-1893, new desks were ordered, maps and charts were made ready, the boys' dining room was decorated, the kitchen enlarged and new utensils provided. However, when the school opened in March it was noticed that only 28 boarders and 10 day pupils were present. The highest number in attendance that year was 42; 28 boarders and 14 dayscholars. This was due to a number of reasons. However, it was a blessing in disguise as it gave the Brothers more time to plan and prepare for the future and enabled them to lay the foundations of the present block of buildings. Again at the end of 1893 the school was examined and a concert was organised for the distribution of Prizes at which His Honour Sir Charles Crosthwaite, K.C.S. and the Lt. Governor of the N.W.F.P. and Oudh presided. His Honour stated at the conclusion of the evening's entertainment that it gave him great pleasure to be present and to see how the boys acted their parts. Furthermore since the school was now being more widely known he had no doubt that the numbers would increase, especially when the people learned of the excellent teaching and discipline which were imparted in the Institution. As soon as the school closed early in December, work started on levelling the playing fields, erecting new toilets and providing furniture for a temporary Gymnasium. The year 1894 opened more auspiciously. The number of boarders and dayscholars had increased. During the year a new kitchen was built and a new bathing room fitted with pipes and heating apparatus superseded the old arrangement. The school now had good playgrounds and a gymnasium and the class rooms and dormitories were large and airy. At this stage a definite course of studies was being followed. The course included the High School or the University Entrance Examination and the Entrance Examination of the Rurki Engineering College. (Recognition for this had been obtained from the Government during the year.) The curriculum therefore comprised English, Latin, Urdu, Mathematics, Science, History and Geography, Drawing, Singing, Carpentry, Military and Physical Drill, optional extras were Greek, French and Instrumental music. During the early days of December several applications for admission were received. These had to be studied carefully as the authorities felt that although the numbers were still low it would not do to fill the school with undesirable characters and hence only a small proportion of those who sought admission were selected. Early in 1895 Br. Stephen died. His death was a great loss to St. Joseph's. He contracted a cold which he neglected. It turned into pneumonia and in a few days he was dead. He was one of the Calcutta Congregation Brothers before we took over. He was born in Meerut of Irish parents and was only 58 years at the time of his death. He was buried in the Military Cemetery on the Bhowali Road, but his remains were brought in more recent times to the Brothers' cemetery at Jeolikote where he was reinterred with his other companions in religion. That year Brs. Baptist Culhane and Paul Doherty joined the Seminary. These two Brothers were long associated with St. Joseph's and their memory is still fresh there. The annual report for the prize distribution states "The attendance has now gone up by 60 per cent. It must not be forgotten that while emphasis is placed on the academic side of life at the Seminary the physical side is not neglected our football and cricket teams did some good work during the season in competition with the other schools of the station and with the Depot. Our Cadet Corps is keeping pace with the growth and development of the establishment. In the-Inter-School Company Match the team put forward by the Seminary carried off most of the Prizes. Our boys are also taught various forms of Physical and Gymnastic Exercises such as bar-bell drill, dumbbell drill, fencing etc., and in these they had been greatly encouraged by Col. the Hon'ble La Touche, Commanding the Naini Tal Volunteer Rifle Corps, and by Captain Barry, Adjutant, Naini Tal Volunteer Corps. The number of Brothers on the Staff had now been-increased to six and a Matron had been employed whose principal duty was to look after the smaller children. In 1896 Rev. Br. Baptist Holland was appointed Principal of St. Joseph's.There was a great rush of boarders that year and as the dormitories could accommodate only 116 boarders, several boys had to be refused admission. Some of them were able to secure lodgings in the town and attended as dayscholars. Towards the end of March an epidemic of measles broke out in the school. This upset classes considerably for some time. Some of the boys got pneumonia and had to be sent to Ramsay Hospital by order of the Civil Surgeon. However, by the end of May all had recovered and the gloom which lay over the College disappeared and once again joy and happiness pervaded the entire campus. At the end of August the school was examined by Mr. Cross, Inspector of schools. He spent two days at the examination. On the first day he devoted his time to listening to the teaching given, while the second day was spent in examining the children and inspecting the dining room, kitchen, dormitories, boxroom and all other parts of the building. His report was excellent. He asked the school authorities to try to put up more buildings to accommodate the ever-increasing number of boys who sought admission. He suggested that they should apply for a building grant for this purpose. While attention was given to studies, games were not neglected and we read that that year,of the fifteen football matches played by our 1st Eleven against other teams in the station, 9 "wins" and 3 "draws" was the score in favour of the Seminary. Similarly, of the five cricket matches played, the College had 4 "wins" and 1 "draw". The Cadet Corps was now in a flourishing condition, and was becoming more and more effective each year. That year they won a large number of prizes. Br. Baptist was most anxious to enlarge the buildings and hence as soon as the boys went home in December, work was started. It was hoped that the work would be completed for the reopening of school in March 1897 but the contractors gave a great deal of trouble and it was not possible to have the building ready: hence the school authorities could not admit any more boarders. In June 1897 the work on the New Wing was resumed and it was hoped that it would be finished in time for the re-opening of school in 1898. Seeing the many applications for admission, it was decided to enlarge the original design considerably so that when the building was completed it would house a minimum of 230 boarders comfortably. Early in 1897 the results of the Examination for which the boys sat in November and December began coming in, and it is gratifying to note that of the 62 boys who sat for the Primary, middle and High School examinations there were only four failures. To guard against contingencies, the authorities purchased Stone Cross House and grounds, the former for an infirmary and the latter as a playing field, and garden. At this stage we may be pardoned if we diverge a little and give the reader a brief glimpse into the origin of "Stone Cross". In the year 1839 while on a shooting trip, Mr. P. Barron of Shahjahanpur District, J.P. got information about a lake in the vicinity of Bhim Tal and with difficulty was able to locate it. In the year 1841 the discovery of a lake in the Kumaon area was first mentioned in the "Englishman" of Calcutta. This was followed by a description of the place by Mr. Barron in the "Agra Akhbar". He foresaw great possibilities for Naini Tal and wrote under the title of "Pilgrim". In 1842 it was decided to grant building leases and Mr. Barron was the first to build a house known as "Pilgrim's Cottage" near the Naini Tal Club. He was supposed to be the first person to launch a boat on the lake. It is said that "Stone-Cross", of which we made mention above, claims the same antiquity as "Pilgrim's Cottage". At this time also it was decided to build two handball alleys. It was hoped that they would be ready for the 1st of March 1898 when the boys returned to school. The Educational Department made a thorough inspection of the school during the month of August and it is gratifying to note that their comments are most favourable. It is not necessary here to give the achievements in the various games as it would only bore the reader. It is sufficient to say that at this time the foundations of the traditions for which St. Joseph's stood were laid and have withstood the test of time. The inspector's report makes mention of three noticeable points (i) the increased accommodation for the pupils (ii) the increased attendance and (iii) the distinctions won by the pupils at the previous year. A table showing the gradual growth of the Seminary over the previous seven years will give the reader some idea of the progress made at this time. From that date onwards the numbers remained steadily around the 200 mark with more pupils trying desperately to get admission. These had to be refused until such time as we had the proper accommodation in the dormitories, classrooms and dining hall. During this time also, work went ahead at the levelling of the playgrounds. The five courts had been erected and very soon a number of boys became expert at handball. At this time the College could boast of one large field for football and cricket, a second play-ground for the smaller children, a gymnasium, two fives and tennis courts. On the opening day of school in 1899, there were one hundred & twenty five boarders present, and the next day the remaining twenty arrived.That evening seventeen more pupils arrived to get admission but they had to be turned away. They asked if they could be accommodated in the School hospital but this, too, was refused. It was a blessing because on the 26th April one of the bigger boys took ill. The Civil Surgeon was summoned and to the astonishment of all, he pronounced the illness as small-pox. The boy was immediatelv removed to the School hospital and the services of a trained Nurse procured to look after him. A few days later two more cases were reported and the College was placed in quarantine for 15 days. The parents and the local people were marvellous during those trying days and it was then evident who were the friends and benefactors of this growing establishment. However, by mid-May the clouds had lifted and once again happiness prevailed in the College. Sports, studies, games and concerts filled up the school year. "The Naini Tal Gazette" of September 30th contains the following reference to the Annual Entertainment of that year. "The boys of St. Joseph's Seminary gave an excellent entertainment in their school last Saturday afternoon. It consisted of a dramatic performance ''The Outlaw" and several vocal and instrumental pieces. The drama was a great success and went well from start to finish". "After the performance, the Lieutenant-Governor, who presided, presented medals to Masters Campbell, Sullivan and Leahy for having respectively obtained the First place in the High, Middle and Primary school Examinations of the previous year". The staff for 1899 consisted of 8 Brothers, 3 Secular teachers, one Urdu teacher, 2 Music instructors (Piano and Violin) and two Matrons who looked after the small boys. By the end of the year the number of pupils had risen to 188 of whom 160 were boarders and 28 were dayscholars. In 1900, as in former years the number of applications exceeded all expectations but there were also some withdrawals. During the early months of this year the work of extending the large play-ground was carried out. On account of the difficulty of the job it was not fully completed by the re-opening of school and hence had to be left in a rough state to be finished during the Christmas holidays. A special Department was started at the reopening of school. The subjects for this Department were divided between Brs. Columban, Fabian and Baptist. On the 21st of May there were 203 boys on the Registers. The School was examined on the 18th and 19th of July by Mr. Cross, inspector of schools. From the Inspector's report, we just take a few points "A good healthy, vitalising spirit pervades the entire Seminary. Year by year it is gradually realising the high expectations entertained of it from the beginning. Every effort compatible with solid progress and durability is being made to meet the educational requirements of those attending the school. Two pupils have recently passed into the Roorkee Engineering College, while several others are engaged in preparing for the University and for several branches of the Provincial Service." With a remark from Very Rev. Fr. Engelbert O.C., Vicar General of the Diocese we conclude this first instalment of the History of St. Joseph's. "The present status of the school is indeed such that it is a source of real and personal satisfaction to think that it has not only to the fullest realised the high expectations entertained of it from the beginning but also that the sapling planted by me in 1889, has grown into a majestic tree, gathering under its branches more than two hundred fine and manly boys who will carry with them into the world the ideals and inspirations implanted in them at St. Joseph's." Noted football commentator Noel da Lima Leitao was found dead earlier today in his hotel room in Kolkata, only a day after being a commentator in the final of the 114th IFA Shield. According to information received by IndianFootball.Com, Noel was found dead in his hotel room at the Hyatt Regency in Kolkata after having sustained a massive heart attack overnight. The hotel informed the Bidhannagar Police station and they have asked for a post-mortem examination to be conducted to confirm the reason behind Noel's death. Noel was only 51 years old and had been in Kolkata along with Gautam Bhimani as a commentator for ESPN for the semi-finals and final of the recently concluded IFA Shield. Noel had been a part of the Indian football scene as a TV expert since the days of Star Sports in 1996 and had been closely involved with Vasco Sports Club in many different positions and roles over the years. Noel was outspoken and hard hitting with his views regarding Indian football but some would also say he was biased in his opinion when it came to Vasco and Goan football. However, no one will surely doubt that he was a knowledgeable person when it came to Indian football. Noel's beloved Vasco SC were supposed to take on Churchill Brothers SC in a Goa Pro League match today but the game was called off as a mark of respect. Noel be sorely missed and fondly remembered by all of us. 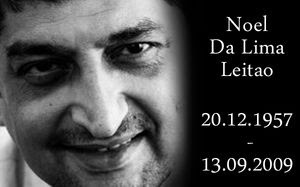 This morning, I read the terrible news that an alumnus, Noel da Lima Leitao passed away in a Kolkata hotel on Sunday. Noel was from the ISC (Class 11) batch of 1974 (Mark Sen, Carl Keelor, Louis D'Souza, Nariman Gandhi)- I cannot remember which house he was captain / vice captain of - I think it was either Nehru or Pant. There will be a number of people on this group who remember him well as an all rounder - including his performance in "The long, the short and the tall". His brother Eric was a couple of years junior. On Saturday I was flipping channels when I heard his voice covering the IFA Shield final. The next day, he was gone! Our condolences go out to the family! we LOST our Batchmate (Class of 1974) NOEL da LIMA LEITAO (DON as he was affectionately called by us ) ..
for those of you who remember him.... he was a true SEMITE.. always had time for everyone, always concerned,always there to help in case anyone had a problem... a GREAT and WARM HEARTED person..
With a heavy heart, this is to inform that Noel da Lima Leitao ( SC 74) sudden untimely demise has come as a shock to all of us. and a gentleman who was always there to help. donated generously on a monthly basis, year after year. SEM has lost one of its brightest alumni and will be truly missed by all of us. and courage they will need for the times ahead. For the Semians who have not known him, plse revert to www.indianfootball. com/ Vasco Sports Club on Facebook. Too young to move on, sorry to hear that. I remember, Noel vividly in school. I did not even realize Noel was a soccer celebrity and commentator. I remember him and Nariman Gandhi standing up to Mark Sen when Mark decided to get heavy handed on some frachaas for taking their time in getting to the study room in the morning. He will be deeply missed by the alumni of SEM. May God give his family the fortitude to bear with the loss. May his soul rest in peace. The history of St. Joseph's College Nanital is closely linked with that of the Dicocese at Allahabad. 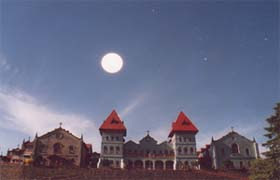 Originally the name was St. Joseph's Seminary, (hence the present day popular name 'SEM') and its birthplace was Darjeeling. The very Rev. Father Englebert O.M.C. presided over St. Joseph's Seminary in Darjeeling. In 1887 the ecclesiastical authorities in Rome transferred that district to the Archdiocese of Calcutta. The most Rev. Dr. Pesci O.M.C. was Bishop of Allahabad in those days, and with the sundering of Darjeeling from his diocese the question of a site for a good school of his Catholic flock became pressing. He selected Nanital. Thither towards the end of January 1888 came Father Englebert accompanied by some of his Darjeeling pupils. To avoid a break in the continuity of their studies while the new premises were being erected, a rented house was taken for the year 1888. That house was Long View which was situated a stone’s throw from the college. Meanwhile in March of the same year, the foundation stone of the transferred Seminary was laid on a site purchased from a Mr. Read. which cost Rs 2000. A Mr. Mathews was the contractor and the work was executed well and quickly for the premises were ready for occupation on March 1st 1889. This building formed the nucleus of the school and for many years accommodated the boarders providing classrooms, dormitories and dining room. It cost Rs 47,000. Soon the whole estate was purchased from Mr Read. Father Englebert and his pupils entered the new building on March 1st 1889. His staff consisted of Rev Father Hickey, Head master, three Franciscan tertiaries and two lay teachers, Sir Auckland Colvin was the Lieutenant Governor of the province then and soon after his arrival in Nanital in May 1889, he formally opened the Seminary, Dr. Pesci, Father Englebert and many friends being present. In 1890 application was made to the Government for formal recognition of the school and Mr. Nesfield, the then Inspector of European Schools, who was well known to students of English Grammar was sent by the Director of Public Instruction to examine and report on the work. That he was satisfied was provided by the speedy recognition granted. The Capuchin Fathers, besides attending to the school, had also to minister to the spiritual needs of the Roman Catholics of Nanital. Finding the strain too much, Dr. Pesci entered into negotiations with Brother Fabian, Provincial of the Irish Christian Brothers in Calcutta, with the result that the Seminary passed to its present management on April 22nd 1892; pending this change Father Englebert went to Ranikhet as Military Captain, father Francis Uncini being placed temporarily as the head of the school until the arrival of the Brothers. On April 2nd 1892 Brother Fabian arrived with three Brothers namely Stephen Cuddy who was appointed Principal, Baptist Moloney and Luke Rice. Brother Stephen was a happy chioce. He had long experience in the management of boarding schools in Calcutta, understood boys, was a strict disciplinarian and held a fair balance between justice and kindness. In those days the Christian Brothers were unknown at this outpost of the British Empire and there was a good deal of speculation and head-shaking in their regard. Moreover some of the bigger boys were inclined to resent, what, to their logical minds, looked like an intrusion and shaped their conduct in accordance with their convictions. However work went on. The Inspector, Mr. Dodd, called later in the year and satisfied himself that the Brother's methods were sound, thorough and systematic. Brother Stephen held a dramatic entertainment a week later and the residents of Nanital, still curious, came to see it. The analyst of the day said that there was a perceptible melting of scepticism as a result of the training exhibited by the boys in elocution, singing and general tone. The School's subsequent history shows that the number of boarders doubled and the increase was maintained steadily. The increasing numbers necessitated further accommodation. Accordingly, in 1897 the Eastern Wing was begun and completed in July 1898. The lower storey serves as a general study hall for preparing class work. The upper storey is the dormitory for the middle section. In this year was also purchased the 'Stone Cross', a building adjoining the college. It serves a useful purpose as a college hospital. The building of the kitchen and dining room as well as levelling and walling the main play ground were the works of the years 1901 to 1905. The Eastern Wing i.e., the present day Chemistry laboratory and Chapel were erected in 1909. The towers, which form so prominent a feature of the central block, were erected at the same time. About 1910, Donaldabad was purchased and the building is now used as Teachers' residence while the grounds were adapted to play-fields for the small boys. In 1916 the boys' wash room, box room and Concert Hall were erected and during the twenties, the present day class rooms and the mighty walls that surround the property were built. The walls which surround 'SEM' are that of the fortress buttress type which reflect solidity and inspire confidence. Old Boys have many pleasant memories of St. Joseph's and in their reminiscent moods, as they think of the days that have gone, the picture that presents itself more frequently perhaps, than others, is that of the walls. Their construction served a dual purpose. With the memory of landslides of the nineteenth century of Nanital fresh in their minds, the authorities realized the importance of placing the college on a solid foundation. The building of the walls secured a permanency. Then too, with the rapid growth, and development of the college, the necessity of providing ample space for playing grounds was obvious. By cutting away a part of the hill side and by lowering the levels of existing grounds, sufficient stones were procured, the playing grounds extended, and the now famous walls took shape. No easy job this in the pre-bulldozer era. These walls have a special significance. In the middle ages the greater the walls, the greater was the city. So likewise behind the walls of ‘SEM' stands a great college. But greater and more noteworthy by far is the work that is done behind these walls. The many students that are now a credit to their School and Country all over the world, laid a solid foundation for their future life in the shade of these walls. Therein lies the real greatness of the walls of SEM. These trustworthy foundations have been a source of inspiration to both the teachers and the pupils. And thus, thousands of young men have passed from the college portals to the strains of the College anthem "Make sure you play the game", and with a determination to build their careers on the firm basis of the college motto. "Certa Bonum Certamen" FIGHT THE GOOD FIGHT. While we, the alumni of SEM, are aware that we may never manage to repay all that our beloved Alma Mater has done for us, this blog is our humble design - a token of thanks - for anyone who has ever been associated with SEM. An institution more than a century old is bound to have a glittering alumni body, and SEM is no exception. Every alumni, teacher, friend of SEM, is invited to contribute to this blog. For every SEMian the story begins with the first unsure steps into the imposing campus. This is followed by a spell of events, uniquely SEMian, until one finds oneself walking out of the gates with a heavy heart but surer steps. And then... The SEM story continues because You can take a SEMian out of SEM but not SEM out of a SEMian. We are looking forward to a spirited response from the SEM community.